Cambodia - the land of the famous ancient temple complex - Angkor Wat - the archaeological area of enormous size, which was featured in Hollywood films like Tomb Rider. The sight of the trees slowly devouring the temples wrapping them around with the twisted branches and roots will easily amaze anyone. Although thousands of tourists visit the site everyday, due to its gargantuan area, they are spread so sparsely that you can feel as if you were a pioneer discovering the forgotten, bygone world. The capital, Phnom Penh, is one of the most hectic cities in Central Asia and not very touristy. It has some beautiful monuments, palaces and temples in its offer. We also made the infamous trip on the overnight bus from Angkor Wat all the way to the coast which disappointed us a bit. The beaches weren't too attractive and the scale of pollution - terrifying, at least in Sihanoukville where we ended up. I've fully described Angkor Wat complex - which temples to visit, how much time to spend and how to avoid ubiquitous scams - take a look at the post below. Soon, I'll also write about the capital Phnom Penh and the short trip to the coast. Phnom Penh is a peculiar city. As usual, in the South East Asia, the Cambodian capital is a mix of perfection, world class architecture and pure chaos. 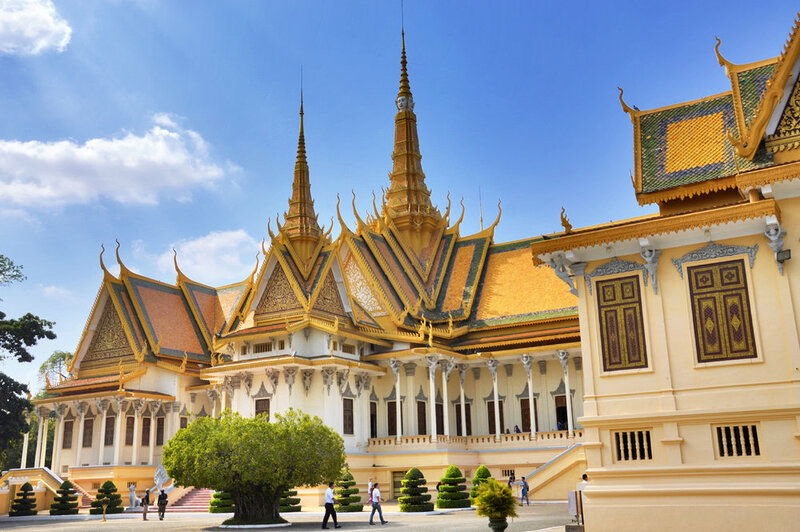 What I liked about it was the fact that Phnom Penh is surprisingly way less popular than cities like, let's say, Bangkok and yet it boasts equally magnificent architecture - such as the royal palace and the temples. Phnom Penh is mainly associated with one of the saddest events in the history of human kind - the Cambodian genocide. But now the Cambodian capital has risen from the ashes and should be looked at and admired as an interesting stop during the journey in the country. Angkor Wat is one of the largest and most impressive temple complexes on Earth. It's also one of world's most famous historical sites - it's visited by literally millions of tourists every year. I prefer more, to be honest, the hidden and unpopular places skipped by everyone, like for example the regions of Caucasus and Central Asia which, although possess everything a perfect tourist destination should have: ancient civilization history, spectacular, diverse landscapes, oriental towns, beautiful seaside and friendly locals; are completely free of western visitors. But I also love historical and archaeological sites so I decided (persuaded by my friends into visiting South-East Asia), why not to see what Angkor Wat is really like. After all the excitement I'd had about Thailand was shattered by the endless scams (especially in Bangkok - read my story here), I was pretty skeptical about Cambodia. But even though I fell victim to a few dishonest people in Siem Reap, I enjoyed Angkor Wat more than any of Thai religious sites, although they were also exceptionally impressive. The sheer size, grandeur and sophistication of Cambodia's main landmark easily compares to the absolutely most magnificent places on our planet like Machu Picchu in Peru, Pompeii and Herculaneum in Italy or Bagan in Myanmar.